Jan. 22 (Bloomberg) -- Crude oil fell below $76 a barrel and is poised for a second weekly decline after a report showed U.S. refineries slashed operating rates as fuel demand dropped. Oil dropped for a third day after the U.S. Energy Department said that plants ran at 78.4 percent of capacity last week, the lowest rate outside the Atlantic hurricane season since at least 1989. Gasoline stockpiles surged to the highest level since March 2008. Fuel consumption in the past four weeks was 1.8 percent lower than a year earlier. “The market would be pretty concerned with refinery rates,” Mark Pervan, senior commodity strategist at Australia & New Zealand Banking Group Ltd. in Melbourne, said by phone. “It’s flagging weaker demand and also that supplies are ample,” he said. Crude oil for March delivery dropped as much as 46 cents, or 0.6 percent, to $75.62 a barrel in electronic trading on the New York Mercantile Exchange. It was at $75.73 at 11:27 a.m. Sydney time. Yesterday, the contract fell 2.1 percent to $76.08, the lowest settlement since Dec. 22. Oil has dropped 2.9 percent this week as falling equity markets dented investor confidence and the rising dollar reduced the investment appeal of commodities priced in the currency. The dollar yesterday reached its highest against the euro since July 30 on a report that the European Union was preparing a loan for Greece. The report was denied by Finance Minister George Papaconstantinou. The U.S. currency was at $1.4091 per euro at 11:15 a.m. Sydney time, from $1.4085 yesterday. Analysts had expected U.S. refining rates to decline to about 80.8 percent from 81.3 percent a week earlier, according to a Bloomberg News survey. Gasoline inventories rose 3.95 million barrels to 227.4 million in the week ended Jan. 15, the Energy Department report showed. Stockpiles were forecast to climb by 1.75 million barrels, according to the median of 18 analyst estimates. Inventories of crude oil fell 471,000 barrels to 330.6 million, the department said. Supplies were forecast to rise 2.45 million barrels. Supplies of distillate fuel, a category that includes heating oil and diesel, fell 3.26 million barrels to 157.1 million. Analysts were split over whether stockpiles increased or declined over the period. Brent crude oil for March settlement declined $1.74, or 2.3 percent, to $74.58 a barrel on the London-based ICE Futures Europe exchange yesterday. Jan. 22 (Bloomberg) -- The yen gained to a nine-month high against the euro amid concerns that President Barack Obama’s proposal to restrict risk trading at financial institutions will discourage demand for higher-yielding assets. The Japanese currency was set for a second straight weekly gain versus the euro and a three-week advance against the dollar on speculation Asian stocks will join a global equity slump. Canada’s dollar touched a three-week low as oil slid and investors speculated China will curb its economic expansion. “Trading restrictions at banks will enhance risk aversion,” said Soichiro Mori, a Tokyo-based strategist at FXOnline Japan Co., a margin-trading company. “This will trigger a flight to safety assets” such as the yen. The yen advanced to 126.89 per euro at 8:41 a.m. in Tokyo from 127.37 in New York yesterday. The Japanese currency reached 126.56, the strongest level since April 28. It gained to 90.08 per dollar from 90.43 yesterday after reaching 89.87, the highest level since Dec. 18. The U.S. currency traded at $1.4085 versus the euro from $1.4084 yesterday, when it rose to $1.4029, the most since July 30. Canada’s currency, the loonie, touched C$1.0525, the weakest this year, before trading at C$1.0518. Crude oil slid 2.3 percent yesterday and the MSCI World Index fell 1.5 percent. The loonie tends to track commodities and equities. The 30-day correlation between the MSCI World Index and the Canadian currency is 0.75. A reading of one would indicate they move in lockstep. The dollar slid yesterday against the yen for the first time in four days as Obama called for limiting the size and trading activities of financial institutions as a way to reduce risk taking and prevent another financial crisis. The proposals will be part of an overhaul of regulations and would prohibit banks from running proprietary trading operations or investing in hedge funds and private equity funds. The Standard & Poor’s 500 Index lost 1.9 percent yesterday. The gross domestic product of China, the world’s largest consumer of many of the raw materials, grew 10.7 percent last quarter from the year before, the nation’s statistics bureau said yesterday. That was faster than the 10.5 percent median forecast of economists in a Bloomberg News survey, sparking speculation that China will step up monetary tightening to curve inflationary pressure. CPO 3rd month Apr futures contract traded RM44 higher to close at RM2488 levels as compare to previous trading sessions with a total of 11,489 lots traded in the market. CPO price surge higher as soybean oil and crude oil electronic trading rose during 2nd trading sessions despite opened lower as soybean oil and crude oil overnight trading were traded weak. CPO price manage to surge higher after manage to reach RM2410 support levels; 61.8% Fibonacci support levels, after manage to complete several Fibonacci cluster at RM2410 regions. Technically, CPO price are highly possible to reverse back to uptrend after MACD shows 2nd bull divergence appear in the hourly price chart together with other technical indicators as well. CPO price would further confirmed reverse to bull trend on short term wave count provided support levels at RM2410 and RM2430 were not violated during trading session while resistance levels were seen at RM2510 and RM2530 regions. FKLI Jan Futures contract traded 1.5 point higher to close at 1304.5 levels as compare to previous trading session to with a total of 3,045 lots traded in the market. FKLI was traded sideways during trading sessions as KLCI was holding firm despite regional indices especially Hang Seng Indices plunge lower during trading sessions due to effect of China Government decision to implement unfavorable policy on financial industry. FKLI tested previous high levels at 1307 regions after opened and supported above support levels at 1302; 61.8% Fibonacci support levels. FKLI was seen traded below the support trend line of rising wedge in the hourly chart after retest resistance levels at 1307 regions. Technically, FKLI was seen trading at critical moment as support levels for trading FKLI gets nearer and yet FKLI still trading within range from 1300 to 1307 regions. FKLI would remain intact with Bull rally provided support levels at 1300 and 1295.5 were not violated during trading sessions while resistance levels were seen at 1309.5 and 1314. Jan. 21 (Bloomberg) -- Palm oil declined to the lowest in two months amid concern imports by China, the largest vegetable oils user, may decline this year because of ample supplies of domestic and imported oilseeds and oils. April-delivery palm oil dropped as much as 1.5 percent to 2,407 ringgit ($715) a metric ton on the Malaysia Derivatives Exchange, the lowest intraday price since Nov. 20. The contract paused at 2,440 ringgit at the 12:30 p.m. trading break. China’s vegetable oil purchases may fall from last year’s record to below 9 million metric tons in 2009-2010, the China National Grain & Oils Information Center said today. On Jan. 13, it estimated palm oil imports climbed 23 percent last year to an all-time high of 6.4 million tons and rapeseed imports reached 3.2 million tons, the highest-ever. “The key reason” for lower imports this year “is higher domestic soybean and oilseeds supplies,” China National Grain said in a report today in Chinese. Malaysian palm oil prices are falling despite an increase in exports because of the bumper soybean crop and edible oils supply, the report said. Exports gained 6.9 percent in the first 20 days of January to 945,311 tons, according to Societe Generale de Surveillance. The gain was 7.7 percent to 924,003 tons, rival cargo surveyor Intertek said. World soybean production in the crop year that began Oct. 1 will be a record 253.4 million tons, up from 210.9 million last year, the U.S. Department of Agriculture said Jan. 12. Soybeans for March delivery on the Chicago Board of Trade climbed for the first time in five days, gaining 0.4 percent to $9.535 a bushel at noon Singapore time. That’s still 5.6 percent below the price before the USDA forecast. Soybean oil for March delivery traded in Chicago is trading at 36.82 cents a pound at 11:59 a.m., a loss of 7 percent since the USDA report. The premium of soybean oil over palm oil narrowed to $75 a ton this week, the lowest in at least a year and less than half the 12-month average, according to Bloomberg data. The premium is now at $89.27 a ton. September-delivery soybeans in Dalian were little changed at the 11:30 a.m. trading break, at 3,862 yuan ($566) a ton. It was as low as 3,852 yuan earlier, the lowest in intra-day trading since Nov. 24. Dalian soybean oil for September delivery dropped a second day, losing 0.3 percent to pause at 7,336 yuan a ton. Dalian palm oil for September also dropped 0.3 percent to 6,684 yuan at the break. Jan. 21 (Bloomberg) -- Crude oil traded below $78 a barrel after falling to a four-week low as a stronger dollar reduced the appeal of commodities and on speculation oil inventories increased in the U.S., the world’s biggest energy consumer. Oil dropped yesterday as the dollar climbed against the euro after China took steps to curb lending and as Greece’s bonds tumbled. Prices also decreased on speculation that a government report today will show a third consecutive gain in crude stockpiles. Crude oil for March delivery traded at $77.71 a barrel, down 3 cents, in electronic trading on the New York Mercantile Exchange at 11:16 a.m. in Sydney. Yesterday, the contract declined $1.58, or 2 percent, to end the session at $77.74. The February contract, which expired yesterday, fell $1.40, or 1.8 percent, to $77.62. An Energy Department report today will probably show that crude oil supplies climbed 2.4 million barrels in the week ended Jan. 15 from 331 million the prior week, according to the median of 17 analyst responses in a Bloomberg News survey. Gasoline supplies rose 2 million barrels, the survey showed. The American Petroleum Institute reported yesterday that crude-oil supplies declined 1.8 million barrels to 328.3 million last week. The dollar traded at $1.4116 per euro at 11:17 a.m. in Sydney, from $1.4106 yesterday. A stronger dollar reduces the appeal of commodities as an alternative investment. Chinese regulators asked some of the nation’s banks to limit credit after the institutions lent a record 9.59 trillion yuan ($1.4 trillion) last year. Cuts in Greece’s credit rating last month fueled investor concern that the country may be forced out of Europe’s single currency. Brent crude oil for March settlement declined $1.31, or 1.7 percent, to end the session at $76.32 a barrel on the London- based ICE Futures Europe exchange yesterday. Jan. 20 (Bloomberg) -- Soybeans fell to a three-month low and corn extended the longest slump since 2005 as the rising dollar reduced investment demand for commodities to hedge against inflation. The dollar rose the most in more than six weeks against a basket of six major currencies on concern that the global recovery will slow as China took steps to tighten credit. World soybean output is forecast to surge 20 percent to a record this year, and corn production may be the highest ever, the U.S. Department of Agriculture said last week. Soybean futures for March delivery dropped 13.5 cents, or 1.4 percent, to $9.50 a bushel on the Chicago Board of trade, the fourth straight decline. The price earlier touched $9.4075, the lowest level for the most-active contract since Oct. 9. Soybeans have declined 9.4 percent this month as rain increased yield potential in Brazil and Argentina, the two biggest producers and exporters after the U.S.
Corn futures for March delivery fell 1.25 cents, or 0.3 percent, to $3.68 a bushel in Chicago, after touching $3.6225, the lowest price since Nov. 2. The most-active contract dropped for a seventh straight session, the longest slump since September 2005. Corn has fallen 11 percent this month, dropping after the government said on Jan. 12 that farmers produced record crops last year. Corn is the biggest U.S. crop, valued at $47.4 billion in 2008, followed by soybeans at $27.4 billion, government figures show. The U.S. is the world’s biggest producer and exporter of both. Jan. 21 (Bloomberg) -- The dollar and the yen declined on speculation the five-day rally in the two currencies against the euro was excessive. The dollar weakened to $1.4127 per euro as of 10:38 a.m. in Tokyo from $1.4106 in New York yesterday. The yen fell to 129.07 per euro from 128.68. The dollar traded at 91.36 yen from 91.24. CPO 3rd month Apr futures contract traded RM46 lower to close at RM2444 levels as compare to previous trading sessions with a total of 11,500 lots traded in the market. CPO price traded sideways during trading sessions despite wild trading days for crude oil and soybean oil electronic trading during trading sessions. 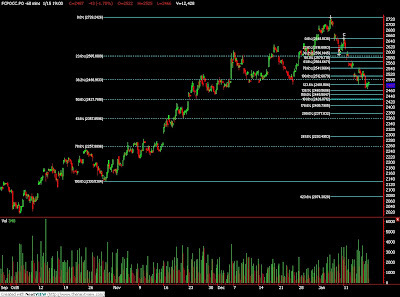 CPO price manage to trade around 150% and 61.8% Fibonacci support levels at RM2446 to RM2440 regions after penetrate previous support levels at RM2460 regions. Technically, CPO price still shows no sign of reversal since previous rebound at RM2500 regions. However, we anticipate strong support levels at RM2427 and RM2360 regions; both at 50% and 61.8% Fibonacci support levels, in order for CPO price to remain intact with bull trend on the medium term. 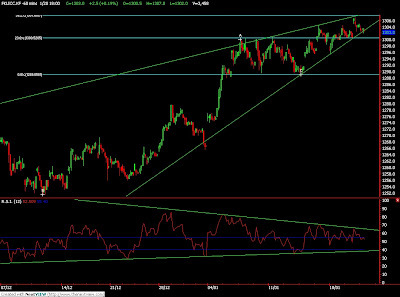 Resistance levels were seen at RM2475 and RM2510 level. FKLI Jan Futures contract traded 2.5 point higher to settle at 1303 levels as compare to previous trading session to with a total of 3,458 lots traded in the market. FKLI was traded lower despite opened higher during morning session as Hang Seng Indices were traded plunge lower since open for trading despite Dow Jones were traded firm on overnight session. FKLI seems fails to penetrate RSI resistance trend line in the hourly chart despite FKLI price manage to trade on new high at 1307. FKLI price still traded within rising wedge formation in the hourly chart while 1307.5 levels was 38.1% Fibonacci resistance levels in the hourly chart. 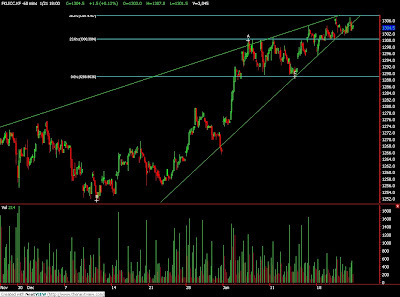 Technically, FKLI sees weak to trade higher when rising wedge formation seen in the hourly chart. FKLI would remain intact with bull trend provided short term support levels at 1295.5 and 1289 regions were not violated during trading session. Resistance levels were seen at 1309 and 1314 regions. Jan. 20 (Bloomberg) -- Crude oil traded near $79 a barrel in New York after rising for the first time in six days as U.S. equities climbed amid improved economic prospects for the world’s biggest energy consumer. Oil advanced as the Standard & Poor’s 500 Index gained the most in two weeks in New York yesterday, helped by optimism about technology company earnings. Prices climbed even as the dollar strengthened against the euro, limiting investors’ need for assets such as commodities to hedge against inflation. Crude oil for February delivery traded at $78.83 a barrel, down 19 cents, on the New York Mercantile Exchange at 10:45 a.m. Sydney time. February futures expire today. The more-active March contract traded at $79.19, down 13 cents. Yesterday, the February contract gained $1.02, or 1.3 percent, to settle at $79.02 a barrel. Trades were combined with those from Jan. 18 because of the Martin Luther King Jr. holiday in the U.S. The Standard & Poor’s 500 Index gained 1.3 percent yesterday. An index of health-care companies in the S&P 500 led the advance with a 1.8 percent rally on speculation Republicans will block an industry overhaul if they win a Senate seat. Defeat in Massachusetts, where polls are due to close at 8 p.m. local time, could cost Democrats a 60-vote Senate supermajority needed to help pass a health-care overhaul. An Energy Department report tomorrow will probably show that crude oil stockpiles climbed 2.5 million barrels last week, according to the median of 11 analyst responses in a Bloomberg News survey. Gasoline supplies probably increased 2 million barrels, the survey showed. Futures dropped 5.7 percent last week, the first weekly decline in five, after U.S. fuel supplies rose. Oil surged to $83.95 a barrel on Jan. 11 as cold weather in the eastern U.S. bolstered consumption of heating fuels and the dollar declined against the euro. The Organization of Petroleum Exporting Countries raised its forecast for global oil demand this year by 20,000 barrels to 85.15 million barrels a day. Consumption will expand 820,000 barrels a day, or 1 percent, from 2009, according to the monthly report from OPEC’s Vienna-based secretariat released yesterday. Brent crude oil for March settlement rose 53 cents, or 0.7 percent, to end the session at $77.63 a barrel on the London- based ICE Futures Europe exchange yesterday. CPO 3rd month Mac futures contract traded unchanged as compare to previous trading sessions to close at RM2490 with a total of 10,914 lots traded in the market. CPO price was traded volatile during trading sessions as crude oil and soybean oil were traded firm after open electronic trading despite recent sentiment seem weak for CPO price were continue to trade on the upside. CPO price manage to rebound 78.6% Fibonacci resistance levels at RM2510 regions after manage to penetrate resistance levels at RM2495 regions. 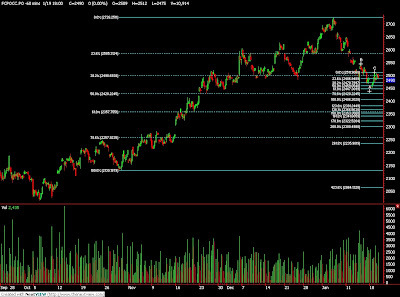 Technically, CPO price seems complete rebound wave 4 counts at RM2510 regions at 78.6% Fibonacci resistance levels while wave 5 count on support levels at RM2430 and RM2400 regions; both were 78.6% and 100% Fibonacci support levels. However, CPO price would trigger further buying interest provided resistance levels at RM2530 and RM2570 were violated during trading sessions. Overall, CPO price still seen intact with uptrend on long term basis provided support levels at RM2143 was not violated. 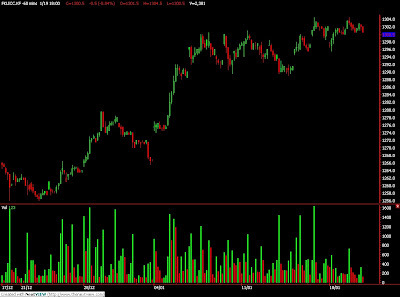 FKLI Jan Futures contract traded 0.5 point lower to settle at 1300.5 levels as compare to previous trading session to with a total of 2,381 lots traded in the market. FKLI was traded with significant lower traded volume during trading session despite volatile trading occur to regional equity indices especially Hang Seng Indices. 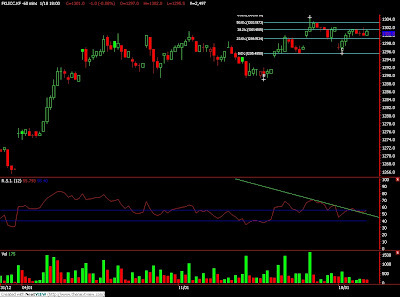 FKLI retest previous high at 1304.5 levels but with far lesser traded volume as shown in the FKLI hourly price chart. Lower traded volume might hint further correction phase due unfinished correction phase from previous trading session as double top formation seen in the hourly chart where neck line seen at 1295.5 regions. Technically, FKLI would encounter further correction if support levels at 1294.5 and 1289 fail to hold against the selling pressure during trading sessions. However, FKLI would remain seen intact with uptrend provided critical support levels were not violated during trading sessions. 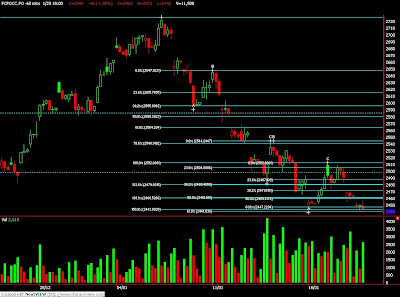 Resistance levels were seen at 1307 and 1314 regions. Jan. 18 (Bloomberg) -- Goldman Sachs Group Inc. said that shortages will reappear in the crude oil market as supply fails to keep pace with a recovery in demand. Global oil consumption will return to levels seen before the financial crisis by the third quarter of this year, Goldman analyst Jeffrey Currie said in a presentation in London today. At the same time, projects to bring new oil to consumers are still lagging as a result of the credit crunch, he said. Crude oil futures traded around $78 a barrel in New York today, having recovered 78 percent last year with the passing of the biggest economic shock since World War II. Investment into new oil capacity is being held up because “political impediments on the flow of capital are still very large,” Currie said at the conference. Foreign companies have difficulties exploring for oil in Saudi Arabia and Iran, the holders of the two largest reserves, because of the state’s control of production in the former and economic sanctions against the latter. “It’s as good as it’s going to get right now in terms of supply growth,” Currie said. Last month Goldman predicted that crude would average $90 a barrel in 2010 and $110 per barrel in 2011. That makes Goldman’s outlook for this year joint-highest among 38 analyst estimates compiled by Bloomberg. Jan. 18 (Bloomberg) -- Currency strategists are more in sync than any time since the depths of the financial crisis, increasing incentives to bet against the yen after the carry trade lost money in December for the first time in 10 months. Forecasts for the euro, yen and Swiss franc from 61 Bloomberg survey contributors are within 9 cents of the mean on average, down from 11 cents a year ago. They haven’t been so unified since Lehman Brothers Holdings Inc.’s 2008 bankruptcy. The predictions’ so-called standard deviation fell 16 percent last quarter, the biggest drop in at least two years, after jumping 48 percent in the three months after Lehman’s demise. The growing consensus signals that foreign-exchange swings will decline, luring investors to sell currencies from countries with lower interest rates to buy higher-yielding ones. That may weaken the yen and franc, and rein in the resurgent dollar. Japan’s currency, which fell 6.6 percent since its 14-year high of 84.83 per dollar on Nov. 27, may be the biggest loser as Prime Minister Yukio Hatoyama fights deflation and a recession. Westpac was one of 2009’s 10 best yen forecasters, data compiled by Bloomberg show. Selling yen to buy Australian and New Zealand dollars, Norwegian krone and Brazilian reais returned 33 percent last year. Using the dollar earned 31 percent. Funding the carry trade with the greenback lost money in December for the first time since February as the U.S. currency gained 4.8 percent against the euro amid growing confidence in the U.S. economy and expectations that the Federal Reserve will raise borrowing costs by June. Futures trading on Dec. 31 suggested a 62 percent chance the Fed would increase its benchmark to at least 0.5 percent by mid-year from a range of zero to 0.25 percent, up from 30 percent in November, Bloomberg data show. The Bank of Japan’s target rate is 0.1 percent. Buying and selling high- and low-yielding currencies to take maximum advantage of global rate moves gained 19 percent from February to November, the carry trade’s best nine months since 2003, a Royal Bank of Scotland Plc index shows. The index fell 0.9 percent in December. “The U-turn in the dollar led to a reverse carry trade in December where people were selling the commodity currencies,” said Theodore Chen, a quantitative analyst at RBS in London who oversees the index. Rapid exchange-rates swings tend to erode the carry trade’s profits. Greater certainty about the direction of currencies this year may help damp volatility, reducing the chances of a repeat of December’s turnabout. Risk returns have shifted in favor of the yen since late last year, as measured by the Sharpe ratio, a gauge of gains that takes volatility into account. In the year ending Nov. 30, selling the dollar versus the currencies of Australia, New Zealand, Norway and Brazil had a risk-premium ratio of 2.31, compared with 1.24 for the yen. Since then, the ratios are 2.71 for the yen and less than zero for the dollar. Analyst forecasts on the yen against the dollar varied from the mean by 9 cents at the end of last week, compared with 10 cents at the end of 2008, Bloomberg data show. Dollar forecasts against the euro also had a standard deviation of 9 cents last week, down from 12 cents. For the Swiss franc, the figure fell to 8 cents, from 11 cents. The Swiss National Bank’s key rate is 0.25 percent. JPMorgan Chase & Co.’s index of volatility in the Group of Seven currencies has fallen 12 percent this year, the most since the two weeks beginning March 27, 2009. Carry-trade returns will benefit this year from the yen weakening 7.2 percent to 98 per dollar from 90.93 today, according to the median forecasts in Bloomberg surveys. The franc is predicted to weaken 4.8 percent to 1.08 per dollar. The dollar has the least bearish outlook -- a 1 percent decline to $1.45 per euro, from $1.4362. Bets on gains for the IntercontinentalExchange Inc.’s Dollar Index -- a gauge against the euro, yen, pound, Canadian dollar, franc and Swedish krona - - outnumber bearish wagers by 6 to 1, the most since March. Even assuming stable currencies, buying 12-month bills in reais, kronor, Australian and New Zealand dollars with Japanese yen will return 5.2 percent more than holding equivalent- maturity Japanese bills, compared with 5 percent for the same trade with the dollars. Selling the yen against that basket of currencies lost investors 34 percent in 2008 as volatility on the Japanese currency against the dollar rose to 26 percent in December, the most since at least 1991. Using the dollar as the funding currency lost 17 percent. “The carry trade works under conditions of low volatility, which is why it was the most disastrous strategy in 2008,” said Stuart Thomson, a Glasgow-based fund manager at Ignis Asset Management, which oversees $100 billion. Yen volatility is likely to decline as the Bank of Japan keeps its benchmark rate on hold through next year as it battles deflation, according to median forecast of 28 economists. Japanese consumer prices are forecast to fall 1.3 percent in 2009, by the same amount in 2010 and a further 0.3 percent in 2011, according to median economist forecasts in Bloomberg surveys. The country’s economy will expand 1.4 percent in 2010, after contracting 5.3 percent last year, the estimates show. In Switzerland, inflation will hold at 0.6 percent through 2010, the Bloomberg survey shows. In the U.S., there is an 80 percent chance the Fed will raise its key rate to at least 0.5 percent by the end of the year, futures trading shows. The U.S. economy will grow 2.7 percent this year, according to the median of 57 economists’ forecasts compiled by Bloomberg. In Brazil, the central bank will increase its rate to 10.5 percent from 8.75 percent as growth accelerates to 4.75 percent from 0.2 percent in 2009, according to Bloomberg surveys. Norway will lift its rate to 3 percent from 1.75 percent, and Australia’s will rise to 5 percent from 3.75, the polls show. Japanese Finance Minister Naoto Kan said Jan. 14 there are “still various policy measures that can be taken,” signaling the Bank of Japan will take further action to aid the economy. Morgan Stanley, Goldman Sachs Group Inc. and Pacific Investment Management Co. analysts said this month the central bank may increase the amount of money it adds into the economy through purchases of government bonds to combat deflation. The Democratic Party of Japan’s popularity has slid since it came to power for the first time four months ago promising to end 20 years of economic stagnation. Prime Minister Hatoyama’s approval rating was at 56 percent this month, compared with 75 percent when he took office, the Yomiuri newspaper said Jan. 11, without giving a margin of error. A weaker yen will benefit Japanese exporters, including Toyota Motor Corp., the world’s largest manufacturer of automobiles, and Sony Corp., which is forecasting a second annual loss. Japan exports more than it imports, giving it a current-account surplus every year since at least 1986, when Bloomberg began collecting the data. Exports accounted for 14 percent of Japanese gross domestic product in the third quarter, compared with 11 percent in the U.S. The policies of the government and central bank are “a signal to the market, saying ‘Hey, use the yen as a carry trade because we’ll be back into the market printing lots of yen to push the currency lower,” said Axel Merk, president of Merk Investments LLC in Palo Alto, California, and manager of the $477 million Merk Hard Currency Fund. Some analysts predict the yen will rise against the dollar as the U.S. currency suffers more from a global slowdown. Eisuke Sakakibara, formerly Japan’s top currency official, said the global recovery may slow in the second quarter, pushing Japan into a double-dip recession and weakening the dollar to 85 yen from 90.85 today. “Should the U.S. experience a relatively weak rebound from spring to summer there’s a high possibility the dollar will drop,” said Sakakibara in a Jan. 15 interview in Tokyo. MUMBAI, Jan 18 (Reuters) - India's soybean futures were trading higher on Monday afternoon after snapping a three-session losing streak on improved spot demand and bargain-hunting, analysts said. "They are trading higher mainly because of short-covering. Export demand for meal is still weak," said an analyst at JRG Wealth Management. At 3:35 p.m., the February soybean contract NSBG0 on the National Commodity and Derivatives Exchange was up 0.77 percent to 2,214 rupees per 100 kg. The contract had shed over 8 percent this month tracking weak overseas markets and sluggish meal exports, analysts said. Soybean is crushed to produce soyoil and soymeal. In Nagpur, a major spot market in western Maharashtra state, price rose by 16 rupees to 2,233 rupees. Indian millers say since oil and meal do not command good prices, processing soybean is economically unviable, leading to sluggish demand for the oilseed in the spot market. India's oilmeal exports slumped 44 percent to 395,663 tonnes in December from 708,631 tonnes a year earlier, a leading trade body said on Jan 6. CPO 3rd month Mac futures contract traded marginally RM5 points lower as compare to previous trading sessions to close at RM2490 with a total of 11,566 lots traded in the market. CPO price plunge lower upon opening for trading as soybean oil and crude oil were traded lower during overnight and electronic trading but CPO price manage to recover from losses due to heavy profit taking activity as CPO price has been traded lower for 6 consecutive trading days. 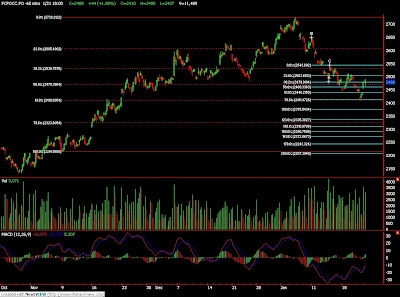 CPO price encounter some buying interest around support levels at RM2440 regions; 150% Fibonacci support levels despite we anticipate strong support levels at RM2427 regions; 161.8% and 50% Fibonacci support levels. 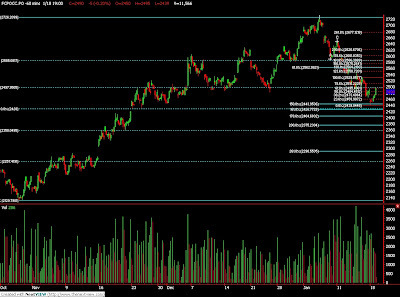 CPO price manage to rebound 61.8% Fibonacci resistance levels at RM2495 regions before end of trading sessions. Technically, CPO price shows interest of buying activity around support levels at RM2440 while we still anticipate stronger support levels at RM2427 and RM2357 regions in order for CPO price to remain traded on a bull rally. CPO price must be traded above resistance levels at RM2530 and RM2590 in order for short term bearish sentiment reverse bullish in the coming trading sessions. FKLI Jan Futures contract traded 1 point lower to settle at 1301 levels as compare to previous trading session to with a total of 2,497 lots traded in the market. FKLI was traded higher despite was opened lower due Dow Jones overnight trading was traded weak while regional indices were traded lower during trading sessions. FKLI manage to retrace 50% Fibonacci support levels at 1296.5 regions while complete projection figure at 1295 at 123.6% Fibonacci support levels before starts to trade higher to challenge resistance levels at 1302 previous day settlement value. Technically, FKLI seems likely to complete minor correction phase at 50% Fibonacci levels and riding on minor wave count 3 provided that support levels at 1295 and 1289 were not violated during trading sessions. RSI in the hourly price chart shows FKLI break up above the resistance trend line which indicate strength towards buyer side. FKLI must be able to trade above resistance levels at 1305 and 1311 regions for further confirmation on recent bull rally. Jan. 18 (Bloomberg) -- Crude oil fell for a sixth day, the longest losing streak in a month, on speculation supplies are more than sufficient to meet demand and as the dollar strengthened, reducing the investment appeal of commodities. Oil traded below $78 a barrel after Qatar’s Energy Minister Abdullah bin Hamad al-Attiyah said yesterday the Organization of Petroleum Exporting Countries won’t change its output quotas because markets are well-stocked. The U.S. currency rose to a one-week high against the euro on concern over Greece’s struggle to contain its budget deficit. Crude oil for February delivery fell as much as 93 cents, or 1.2 percent, to $77.07 a barrel in electronic trading on the New York Mercantile Exchange. The contract, which expires Jan. 20, was at $77.76 a barrel at 1:43 p.m. in Singapore. The more widely traded March futures dropped 28 cents to $78.09 a barrel. Prices dropped 5.7 percent last week, the first weekly decline in five, after U.S. crude oil and refined-product stockpiles rose and temperatures climbed. The dollar reached $1.4335 against the euro, the highest since Jan. 8, from $1.4387 on Jan. 15 in New York. Finance ministers from the 16 nations that use the euro will gather today to discuss Greece’s public finances. U.S. distillate fuel stockpiles, including heating oil and diesel, increased in the week ended Jan. 8, snapping a four-week drawdown, according to the Energy Department. Crude oil and gasoline inventories climbed for a second week. Temperatures in the U.S. northeast, which consumes four- fifths of the country’s heating oil, will probably be above average through Jan. 27, according to the National Weather Service. Oil rallied 4.3 percent in the first 10 days of 2010 as demand for heating fuels gained during a cold snap. Hedge-fund managers and other large speculators increased their bets on rising crude oil prices to the highest since at least 1983, according to U.S. Commodity Futures Trading Commission data. Speculative net-long positions, or the difference between orders to buy and sell New York futures, rose for a fourth week, climbing 25 percent to 135,669 contracts in the week to Jan. 12, the Washington-based commission said Jan. 15. Brent crude oil for March settlement fell as much as 72 cents, or 0.9 percent, to $76.39 a barrel on the London-based ICE Futures Europe exchange. The contract was at $76.76 a barrel at 1:29 p.m. Singapore time. CPO 3rd month Mac futures contract traded RM43 points lower as compare to previous trading sessions to close at RM2487 with a total of 12,428 lots traded in the market. CPO price plunge lower during trading sessions as crude oil and soybean oil electronic trading were traded lower despite of favorable export figure shows increment of 2% from total export amount as compare previous month on the same period. FKLI Jan Futures contract traded 5 point higher to settle at 1302 levels as compare to previous trading session to with a total of 4,158 lots traded in the market. FKLI was traded higher during trading sessions but traded lower before end of closing due to Hang Seng Indices were traded lower as profit taking activity. FKLI manage to penetrate previous resistance levels 1300 after at least 5 attempts in the previous trading sessions but was hold by 78.6% Fibonacci resistance levels at 1304.5 regions. Technically, FKLI seems temporary complete minor wave count and would expect minor correction where support levels were seen at 1294.5 and 1289 regions. 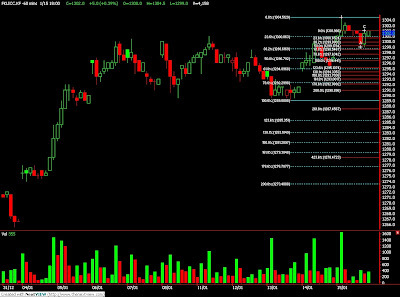 Uptrend would remain intact provided support levels were not violated during trading sessions. However, FKLI would encounter some degree of selling pressure around 1308 and 1314; both were 38.1% and 50% Fibonacci resistance levels, while riding on the bull rally.